Ever considered yourself working as an electrician or what its like to be one? They hold a lot of responsibility under their belts, and there’s probably a lot of things you didn’t know about electricians. Being an electrician can be one of the most interesting jobs there is, instead of being stuck behind a desk or crammed inside an office you’re constantly up and going to different places and houses, you also meet a variety of new people through working with other electricians and companies. So being an electrician is a very worthwhile occupation, not to mention that its the highest paid job within all the trades. So if you want to read some interesting facts about electricians that you perhaps didn’t already know, then here is some that we found. Electricians need to gain a lot of experience, there is no room for mistakes, and everything has to be very precise. To become a master electrician the training time is a minimum of 8 years both in the classroom and hands-on experience. The reasoning behind such a long training time is because just like a doctor an electrician has to be able to figure out and “diagnose” the issue with the correct solution. Often they are faced with dangerous situations due to the fact people aren’t aware of the dangers of electricity or how to manage it so not only does the electrician have to correct the issue but it must also be done in alignment with building and safety codes. Commercial electricians job role includes planning and drawing up electrical systems, but can also work by blueprints provided. 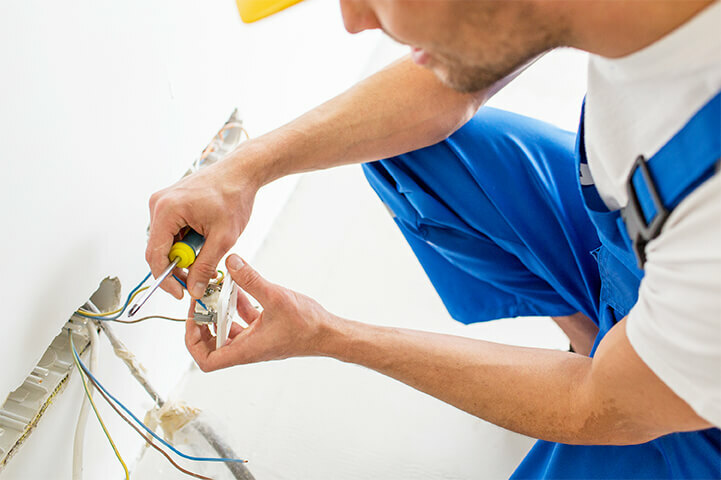 Commercial electricians work with your conventional tools such as saws, pliers, screwdrivers and knives and are usually based in buildings so are not affected by weather conditions. An industrial electrician installs and repairs wiring, fixtures and electrical devices which are carried out in an industrial setting. Their jobs include changing wiring, cleaning circuit boards, ensuring everything is grounded and installing outlets. People usually get into this area of work via an apprenticeship. This job role is explained in the name, a lot of a residential electrician’s jobs are based in residence. These functions include fitting light structures, inspecting electrical components and identifying electrical issues, like our electrical contractors in Bedford. This job is based outside so a lot of work may be affected by harsh weather conditions. The primary duties are to install or repair electrical cables and wires used in electrical power or distribution centres, or working with massive transmission towers. Being an outside lineman requires toughness and grit, venturing up pylons no matter what the weather is a must in getting this job done. You will also receive on the job training to handle heavy pieces of machinery such as cranes and aerial lifts. Rarely getting the opportunity to do any sit-down work electricians are usually on their feet. Climbing into attics and on top of roofs or going underground and crawling into confined places can be tiring and requires a lot of body strength to do so. Bending and squeezing into tiny spaces can be uncomfortable and is not the occupation for someone who does not wish to be dedicated and keep their body in tip top shape. There is an outstanding amount of information that needs to be picked up and as little as four years training as an apprentice before they can even undergo any testing to become a Journeyman Electrician. Math’s has to be a skill, and also the ability to read and understand blueprints, not only that but electricians have impeccable memories and need to be able to memorise federal and local codes and carry out their procedures while to abide by these regulations. Organisation is crucial and quick mindedness to resolve an issue as soon as it occurs, as there is no alternate route when it comes to electricity and all fully qualified electricians know how to control it and its dangers. As the years have progressed more eco-friendly products, have been released on the market, and we are constantly thinking of new ways to help out the environment. Solar panels to provide eco-friendly energy, electric based cars, energy saving bulbs, all of these are installed and maintained by electricians, and they constantly have to keep up to date with all the new technology. In a 2016 Trades Sale Survey, the electrician occupation came out on top once again with the average salary being £30,444 a year. Prices for an electrician can range from £20 an hour up to a set rate of £350 per day, the standard rate for a trainee electrician is around £11.23 an hour so even from a trainees point of view that is a lot of money to someone who could be as young as 16 years old. This type of occupation is being made more of an opportunity for young people to get involved in, electricians are crucial to the future of housing and society especially with technology continuously advancing. The more dependent people are becoming on modern day technology, the more reliant we also become on electricity and electrical appliances. To work in this profession, it is vital that you take a colour test or you will not be successful; they have a colour based system that differentiates the different types of wires, someone who lacks colour visions could potentially make a fatal mistake. Carrying out safety checks is a daily task for electricians and is part of their job, electricity is harmful, and high safety measurements must be taken to work alongside it. A lot of electrical work takes place in buildings doing refurbishments or to restore an old building; these buildings could have been abandoned for years, so it isn’t necessarily known what condition everything is in, such cautious safety regulations must be abided by before any work can begin to take place. Because being an electrician involves a lot of physical and handy work it’s important the correct clothing is worn. Very fitted clothing is essential as baggy clothes are more likely to get caught in tools or on something whilst squeezing through a confined space. Because this occupation involves both inside and outside work clothes suitable for different weather types must be worn, sturdy robust boots or shoes are a must, especially for when climbing or walking across wet surfaces, as there is the risk of slipping and causing an injury.